The three individuals in the top-bracket of Rs.100-500 crore paid a total tax of Rs.437 crore. The data further said that the bulk of individuals, who filed returns for the assessment year 2012-13 earned an annual salary between Rs.5.5 lakh and Rs.9.5 lakh. Over 20.23 lakh taxpayers earned Rs.5.5-9.5 lakh. Further 19.18 lakh individuals earned salary of Rs.2.5-3.5 lakh that year. Six individuals fell in the high-end earning bracket of Rs.50-100 crore of salary income. In the salary range of Rs.1-5 crore, there were as many as 17,515 individuals. The number of effective assesses has increased to 5.17 crore in the fiscal year 2015. But only 1.3 crore individuals actually paid the income tax. While the rest did file income tax returns but they had zero tax liability. From another angle we can see that actually large percentage are captured by Direct taxes. If we take 25 crore households and roughly half of it belonging to “agriculture” households then out of remaining 12.5 crore households. Out of this if 5 crore are assessed that means a large percentage of “taxable” households are covered. Direct taxes constitute around 50% of the total taxes—that means indirect taxes are the other half. Direct tax to GDP ratio is of the order of 5.5 % in 2015-16. Not only that; in Indian context we need to consider Tax rate and bribe rate. If that is also taken into account then we can “guesstimate “direct tax plus bribe ratio to be nearly 9 to a10%. Which is reasonable outgo from earners. The larger issue is the complete omission of Agriculture income from the tax net. Long before it was considered as “meager” and it was also felt as a political vote gatherer and exempted. But after green revolution and changes in cropping pattern –to cash crops- much has changed in that front. 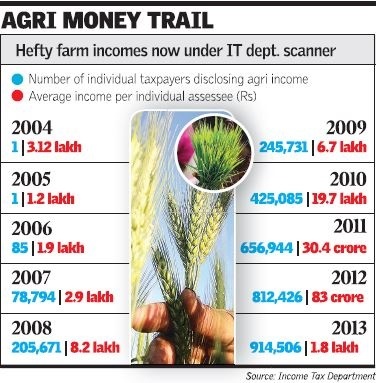 Believe it or not, income figures shared by the Income-Tax Department in response to an RTI application by a retired Indian Revenue Service official has revealed that agricultural income recorded an exponential increase from 2004 to 2013, touching a total of almost Rs.2,000 lakh crore for individual assessees in 2011. The agricultural income earned by the 6.57 lakh assessees who filed returns in 2011, at nearly Rs. 2,000 lakh crore, is over 20 times the country’s gross domestic product of over Rs. 84 lakh crore at the time, according to the Income Tax Department data shared under the RTI Act. Notably, agricultural earnings are exempt from Income Tax. The Income Tax Department has launched an investigation on those reporting farm incomes of more than Rs.1 crore a year. Official data pegs this number at 307 in assessment year 2015-16, up from 180 in assessment year 2007-08. The Department is probing 2,746 such cases — Bengaluru recording the highest of 321 followed by Delhi with 275 and Kolkata with 239 cases — from across the country. Retired IRS official Vijay Sharma — who filed RTI application to the Income-Tax Department — has now moved the Patna High Court seeking further investigations into the matter, raising suspicion that income from undisclosed sources are being shown as agricultural income to evade tax. “The other possibility may be that illegal money or black money income is being laundered in a large scale and brought into the white economy. It requires deep investigation,” Mr. Sharma told The Hindu. He said the next date of hearing on his PIL plea was in April. Not just rich farmers, even agricos with Rs 215 cr profit pay no tax. What isn’t quite as well known is that of more than 400,000 taxpayers claiming exemption for agricultural income in the assessment year 2014-15, the biggest were seed giant Kaveri Seeds – it claimed Rs 186.63 crore (Rs 1.87 billion) exemption and made a profit of Rs 215.36 crore (Rs 2.15 billion) before tax – and multinational Monsanto India, which claimed Rs 94.40 crore (Rs 944 million) as exemption from agricultural income and earned Rs 138.74 crore (Rs 1.39 billion) profit before tax. Agriculture income can be taxed by state Governments but different states have different polices mainly for plantation companies. Uttar Pradesh introduced agricultural income tax in 1948, and repealed it in 1957, one of six states to flip flop thus in the first decade post-Independence. Assam has taxes on plantations but not WB and so also Kerala but not neighbouring Tamil Nadu. Even when Left front was ruling Bengal; they did not tax Agricultural income. Taxing large agriculturists would help widen India’s taxpayer base – as the 2016 Economic Survey recommended – beyond the current 5.5 per cent, or 39 million earning individuals, who pay tax. But there is a need for political will to include Agriculture income under tax ambit and unless it is done one can surmise that large portion of black economy is masquerading as agricultural income and keep itself outside the tax net.